Trendy Relish - Easy and Healthy Indian Vegetarian Recipes, Andhra Recipes Trendy Relish: Happy Birthday to Trendy Relish!!! Happy Birthday to Trendy Relish!!! Congrats and happy birthday to Trendy relish.. Happy Birthday to your Blog. Have a rockiny 2012. Congratulations! Wish you many more to come and I look forward to your wonderful recipes. Congrats dear !! Keep Rocking !! Congrats Uma! It is like yesterday I ve found you, Wish you Many More Happy Blogging! Our happiest Birth day greetings to your 'Trendy Relish' alias Essence of Andrha'. We wish that your continuous and sincere effort will make this blog to celebrate many more birthdays in the future. Wishing your lovely blog to celebrate many many more successful years of celebration. 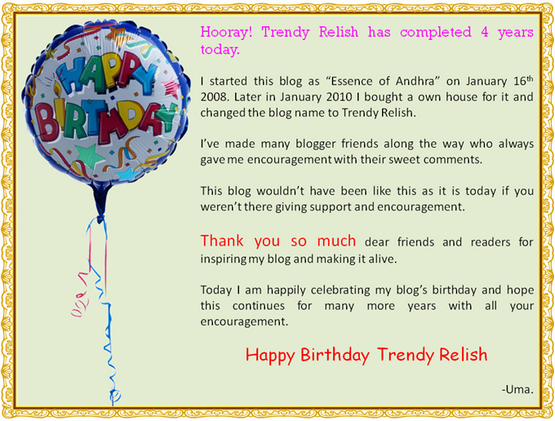 Congrats Uma and happy Blog anniversary..
Hapy bday to trendy relish!! congrats on the completion of 4 yrs of ur blog. congrats uma on ur milestone. Happy b'day Trendy Relish.wish u more like this..
Hi Uma, congratulations. Hope you are doing great. Dear Friends, Thank you so much for your lovely wishes.